Students at I/O Youth code with littleBits. Image: Google. 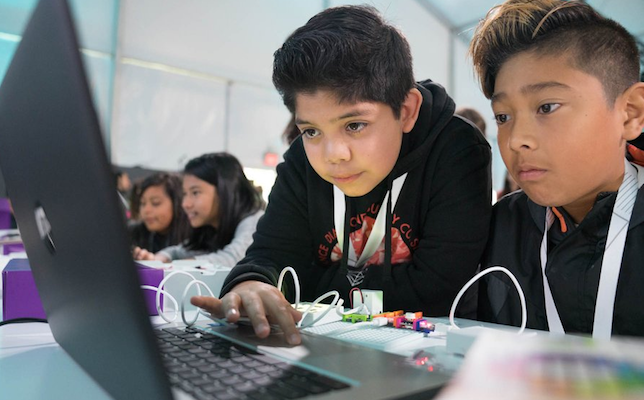 Alongside Google’s annual developer conference last week, the company held its fourth annual I/O Youth event at the Shoreline Amphitheater in Mountain View, CA. Neary 150 students in grades 5-7 from around the Bay Area participated in activities that focused on digital storytelling, science and computer science (CS), according to a company blog post. The event was emceed by leadership at Google's Doodle team and Technovation, a global entrepreneurship program for girls. First, the participating students played around with Toontastic, an iOS and Android app-based game that allows kids to create their own 3D cartoons. Students can “draw, animate and narrate swashbuckling adventures, breaking news stories, science reports and all your other wacky ideas,” according to the Toontastic website. In the process of bringing their stories and characters to life, users can develop digital storytelling skills. Toontastic works on phones, tablets and some Chromebooks; it works offline and is free to download. Students spent time on another app called Science Journal for an experiment that tasked them with building a wind spinner from craft supplies and calculating wind speed. Google worked with the Imagination Foundation to develop the free app, which has hundreds of thousands of downloads in the Google Play Store. With Science Journal, students can record and document information like wind speed using a smartphone’s sensor data. On the coding side, attendees were introduced to the Google CS First curriculum, a framework used by more than 4,600 CS First clubs nationwide. The curriculum takes a block-based approach to teaching CS with Scratch, a free programming language developed by MIT’s Media Lab. Students also developed a hot potato game using the littleBits Code Kit by littleBits. The set employs Google’s Blockly educational games. Participants each left with a littleBits Rule Your Room Kit, the blog post said. Lastly, the event gave the students a dose of immersive educational experiences, taking students on a virtual field trip with Expeditions. Additionally, Google familiarized them with artificial intelligence (AI), demoing Google Assistant and games from Google’s A.I. Experiments project that aims to inspire everyone to start tinkering with machine learning. Learn more about the event on the Google blog.